Singer Leonard Cohen is "unlikely" to recover $9.5m (£5.4m) which a court has ruled was stolen by his ex-manager. Kelley Lynch, who worked for the musician for 17 years, has failed to respond to allegations that she plundered his retirement savings. Ms Lynch, who was fired by Cohen in 2004, refused to return photographs and memorabilia despite a court order. The 71-year-old's case against Ms Lynch claimed that he was left with funds of approximately $150,000 (£85,592). Cohen's lawyer Scott Edelman said of Ms Lynch: "She's hard to get in touch with. I don't know where she lives and I don't have a phone number for her. "We don't know what she did with the money. But she knows what's going on because she leaves me with phone messages at all hours," he added. Mr Edelman also said that an attempt to recover Cohen's possessions from her home with a truck and a police presence was unsuccessful. A Superior Court judge in Los Angeles granted the default order in favour of Cohen earlier this week. A second person named in the legal action, tax expert and lawyer Richard Westin, reached an out-of-court settlement with Cohen last month, the details of which were not disclosed. Mr Edelman said the singer was "glad" this part of the legal process had been completed. "He would prefer to spend his time on creative endeavours," added the lawyer. 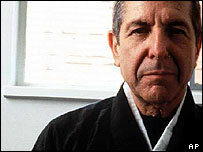 Cohen, who released a new album to mark his 70th birthday last year, was living at a Buddhist monastery in the 1990s when the financial irregularities took place.